SLA is a high-precision 3D printing technology used for creating prototypes, mold patterns, and production parts. It is one of the best technologies for applications requiring accurate form & fit, or fine details. 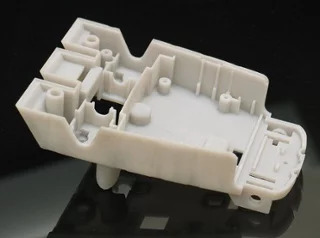 Many SLA materials are available including resins that simulate production plastics, high temperature materials, biomedically compatible materials, and others. A build platform is lowered into a vat of liquid UV-sensitive polymer where a UV laser cures the surface of the liquid and solidifies a single layer of the model. The build platform is dropped a layer at a time and the process is repeated until the part is complete. Support structures are used to ensure that the model is properly attached to the platform, and to support overhanging features. These supports are carefully removed, and support marks are sanded off of the model after printing. With the most precision in 3D printing, smooth surface finish, and variety of materials, SLA is ideal for fit, form and function prototypes. Because of its smooth surface finish, SLA can be easily finished and painted to look like an end-use part. Hollowing parts reduces the part volume and saves you money but you need to add escape holes. Be careful, hollowing out a model can cause structural integrity issues.